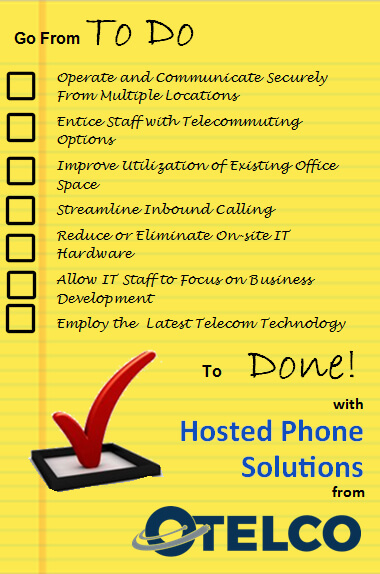 The versatile, simple solution to business phone systems. With Hosted PBX phones, your staff can work from anywhere there is an available Internet connection. Hosted PBX Phone Systems offer outstanding capabilities with customizable features and the versatility to perform multiple functions on a single phone system. Whether you operate a call center, multiple business locations, or have staff that telecommutes, a Hosted PBX Phone System is the business tool for you. Why should you choose Hosted PBX for your business? Hosted PBX Phones from OTELCO are operated on our secure and redundant network, and backed up by 24/7 monitoring and support. Your IT staff can concentrate on your business rather than keeping the phone system operating. In this video, Brian Fejedelem, Director of Switching and Transport, explains the benefits of a Hosted PBX for businesses. How many workstations do I need, and is there expandability when my business grows? How can I make this as simple as possible in order to free up my IT staff for more important tasks? How do I keep pace with changing technology and insure the best functionality of the phone system? Can I have the versatility to connect multiple locations seamlessly and afford my staff the ability to telecommute and manage their own phone settings? Can I reduce the workload for reception staff? Do I need a separate phone system to operate my call center? What is the most secure and reliable way to achieve my communication requirements? Who or what is the best resource to provide you with answers and solutions? 1. Reduce upfront capital cost for your business phone system. Hosted PBX offers you the versatility to add users and features without buying expensive equipment, yet affords you all the functionality of traditional key systems. 2. Free yourself from management headaches. 3. Enable your team to work from anywhere. With Hosted PBX phones, your staff can work from anywhere there is an available Internet connection. While beneficial for telecommuters, Hosted PBX Phones can be invaluable to your business, should disaster strike – our client Katahdin Federal Credit Union is a great example. 4. Select a platform that grows with your business. Adding Hosted PBX workstations is as simple as plugging in an additional phone. There is no additional control equipment to purchase and other than an internet connection, no additional cabling necessary. When enhancements and upgrades are available, OTT Hosted PBX Phones are seamlessly updated from the cloud. 5. Gain the peace of mind of knowing your phone system is when you need it, no matter what. OTELCO’s fully redundant network is monitored 24 /7 and provides peace of mind, since there is always a backup keeping you connected. 6. Tailor your Hosted PBX to your business’ unique needs. Setting our Hosted PBX Phone Solutions apart from other hosted providers is our use of the BroadWorks hosting platform that greatly enhances the features and functions already inherent with hosted phones. A secure web portal augments basic phone functionality and allows users to control and configure their PBX phones to suit their individual needs. For example, an OTELCO Hosted PBX user can, with a few clicks on a web page or via an app on their mobile, selectively forward calls from an office phone to a cell phone. The user portal also simplifies deployment of new features as they occur. There is no need to upgrade your platform for new features; you get them as they become available. 7. Answer and direct calls automatically when you can’t answer yourself. Hosted PBX’s integrated auto attendant answers calls for you and directs your customers where they need to go when you don’t have staff available to answer calls. The system can also be programmed and advance-scheduled to greet callers with customized messages including holiday closings, inclement weather notices, and virtually any message you would like customers to hear when they call in. 8. Effectively manage contact teams with robust call center features. If you operate a call center or any customer service function, whether with 5 agents of 50, you know about the challenges of managing a call queue, quality assurance monitoring, and maintaining a high level of customer care and satisfaction. Hosted PBX can be fully customized to your specifications and the call center module can easily operate at multiple sites or even for home workers. 9. Simply, the best customer care and support available. OTELCO is a brick and mortar company, with well trained local staff to help you assess your needs, provide you with the equipment to meet those needs, install and train you on that equipment, and be there should you call for additional support.